There is so much uncertainty in the field of nutrition. Is saturated fat good or bad? Should we be drinking whole milk or low fat? Should we be drinking cows milk at all? But there is one thing that is unwavering – the importance of vegetables. I bet you have never seen an article entitled, “Vegetables – 6 Reasons You Should Avoid Them At All Costs”. So with that said, how can you get more of these nutritional powerhouses into your daily food regime? One way is to commit to eating a side salad with every dinner. It doesn’t have to be big or fancy. 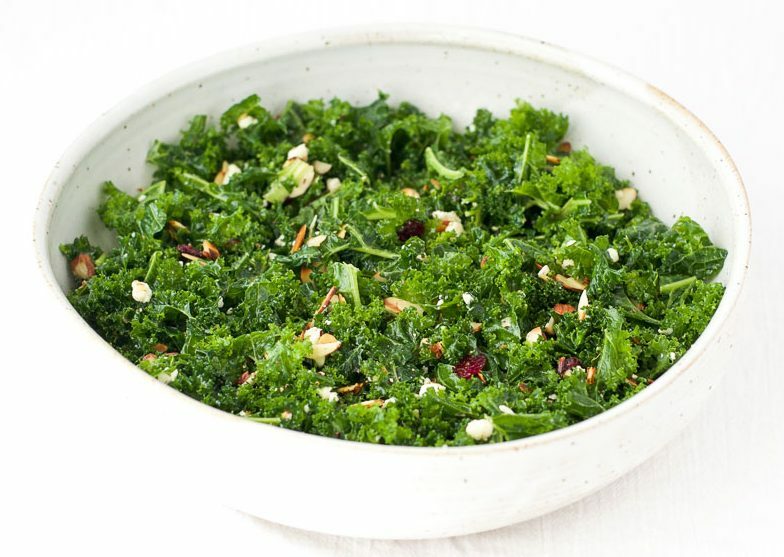 Just a small bowl of fresh greens with a few tasty morsels thrown in, like this delicious kale salad. 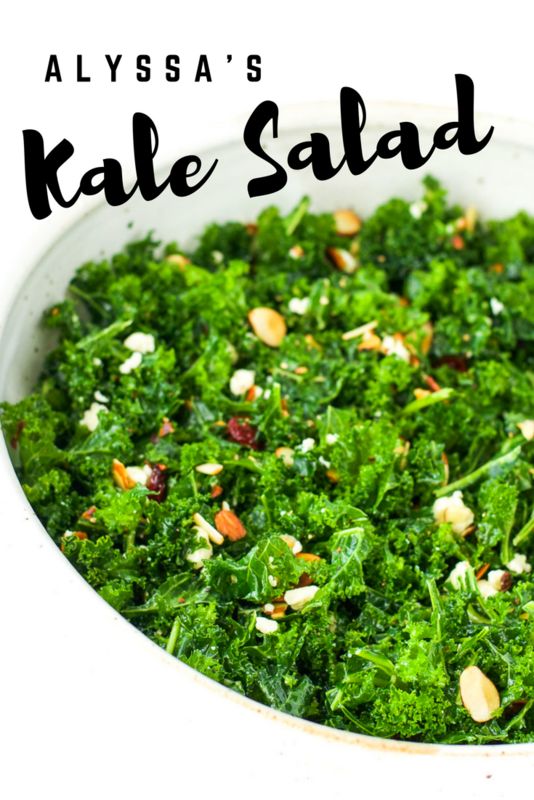 I have to confess up front, I did not create this kale salad recipe. That accolade belongs to my good friend and fellow nutrition student, Alyssa. It is extremely simple, but incredibly tasty. So much so that she doesn’t go far without a bowl of it tucked under her arm (well – to pot luck events at least). 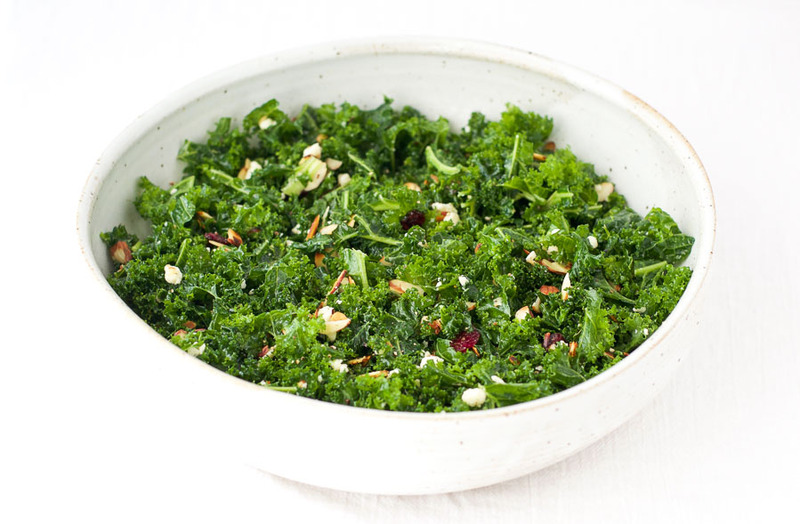 The balsamic dressing is massaged into the kale making it particularly flavorsome. Then you add a few crumbles of salty blue cheese, some tart dried cranberries, and some crunchy toasted almonds to round out the flavor and texture profile of this delicious salad. 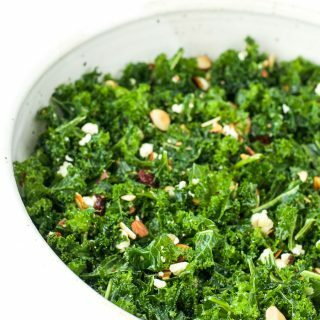 It only takes 15 minutes to make, and you can prepare a large batch in advance making it easy to grab your nightly bowl of greens. So are you ready to commit to eating a side salad with dinner every night? Put the almonds in a dry skillet/frying pan and place over a low heat for 4 minutes, tossing to turn half way through. Keep a close eye on them. If you turn your back for too long they will burn. Remove almonds from the heat and leave to cool. Wash the kale, remove the thick stems, and roughly chop or rip it. 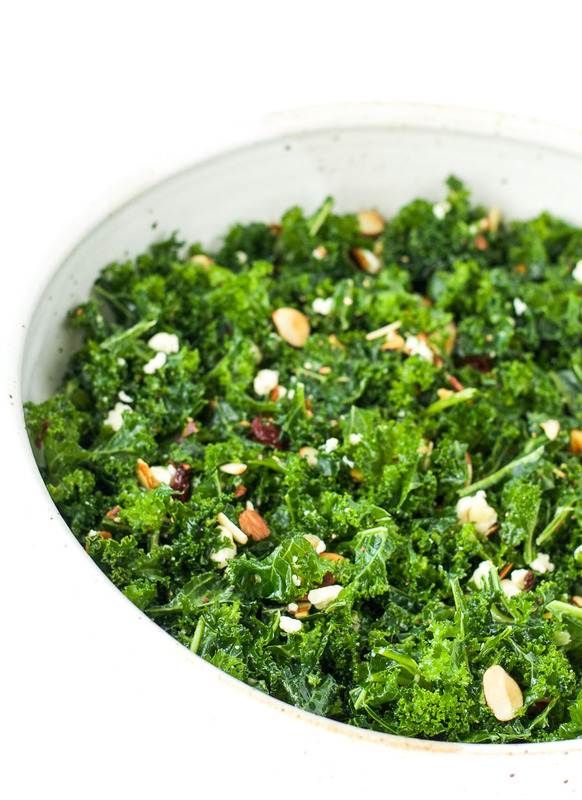 Put the kale in a large bowl. Pour the dressing over the kale and use your hands to massage it into the leaves. Add the almonds, blue cheese, and cranberries, and stir to combine. Serve immediately, or store in an airtight container in the fridge for up to 3 days. *If you want to speed up the process, you can use your favorite store bought dressing. This said tastes amazing! Seriously, I always take a huge bowl, and then have seconds. But never feel too stuffed. Thx for sharing! !